Gran Cucina Italian Gourmet Specialties Fresh from Nature to your Table! Gran Cucina Italian Gourmet Specialties, fresh from Nature to your Table. Welcome to a world of delicious food with the real taste of 100% Italian fresh nature. Chef Marco Aurelio , one of the Gran Cucina's chefs said to us: "At Gran Cucina , when we cook with 100% Fresh Italian Natural Vegetables, we feel like a painter painting a beautiful Italian landscape with lots of paint color choices. The painter paints a masterpiece beautiful to the eyes. At Gran Cucina, we create Gourmet Specialties that will be beautiful to the eye, taste and smell for millions of tables around the world". Each Gran Cucina product that leaves the Gran Cucina big kitchen in Northen Italy, has been carefully prepared and has the Gran Cucina guarantee of freshness and real 100% Italian Ingredient from the Nature of nearby lands. Gran Cucina combines the old fashion way of cooking with the highest standards of technology and food safety international regulations. We say the Italian old fashion way in reference to the hand selection and pick of vegetables by its beauty and taste to make sure we can slowly enjoy every meal with as we taste the its nature flavour. All the products - ingredients- used are 100% from Italian sources, the cooking process is done by Italian chefs at the Gran Cucina big kitchen and every item is bottled and labeled in Italy. How can you get a more Italian meal than this? Only if you are in Italy enjoying the beautiful scenery and service of an old fashion reataurant that still has a chef that will cook for you with the recipes he/she learned from la Nonna- grandmother in Italian-. After meeting all the Gran Cucina Gourmet chefs, we were amazed by their talent and knowledge combined with the art of mixing and combining items from the nature's garden and creating the most delicious Gran Cucina Food Gourmet Specialties products that would help any high class chef, cook or just any person that would like to eat something very tasty and did not have time to prepare a whole meal. We admire the Gran Cucina Chefs and family owners love for the land and our planet as well as the careful and delicate way in which the vegetables are bought from the 100% natural farms - some of them in the beautiful region of Liguria- where we saw the basil growing for the famous Gran Cucina Pesto. The owners of Gran Cucina are very selective when it comes to farmers and suppliers. They visit the 100% natural farmers many times, look at their production from the land to the seeds they plant, visit them duiring the growth of the vegetable to follow the process and right before and after the crop for at least 2 years before they decide to but from them and make them a regular Gran Cucina supplier. Fir any Italian farmer. it is an honor to become a Gran Cucina supplier of 100% natural vegetables or fuits. With this love for nature and the beautiful fruits that come from it is how Gran Cucina produces the best Gourmet Italian Specialties in the market with a lot of history behind or inside each little jar and more than all a lot of Italian Love for Food and for the land. We are very pleased to have found the Gran Cucina line many years ago and to be able to bring it into the United States to make every meal more delicious at an affordable cost. Some of our customers say that once they tried the Gran Cucina line they feel like they are cooking like a chef in no time. So many tasteful ingredients are in a jar that it makes the long tradition of Italian sauces be the most essential element to any meal. Italian Pesto is part of the Italian cooking history. Gran Cucina uses only the best and purely nature fresh ingredients to cook all the products we are pleased to feature on our website. The Gran Cucina gourmet Pestos are home made pestos, cooked in an artisanal way. They taste fresh and you can smell the herbs and the fresh nature once you open the jar. Ideal to cook with meat, pasta, vegetable soups and boiled meat. 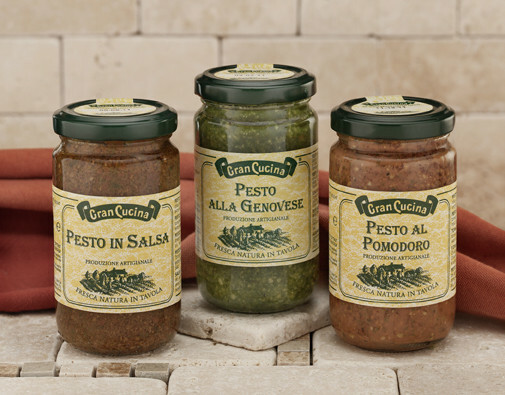 The Gran Cucina Pesto in Salsa is made with the traditional Pesto Genovese and all natural tomato sauce. The Gran Cucina Pesto Genovese is made with basil and garlic. The Gran Cucina Tomato Pesto is made with Pesto Genovese and sundried tomatos. Gran Cucina Pesto in Sauce 6.34 oz. Gran Cucina Tomato Pesto 6.34 oz. GranCucina Pesto in Sauce 17.63 oz. Gran Cucina Tomato Pesto 17.63 oz. Gran Cucina Pesto Genovese 4.50 oz. Gran Cucina Pesto Genovese 6.34 oz. Gran Cucina Pesto Genovese 17.63 oz. Gran Cucina Pesto Genovese 35.2 oz.